Railway Photography by Phil Trotter - Blog: JWN 908: Found in the USA. JWN 908: Found in the USA. 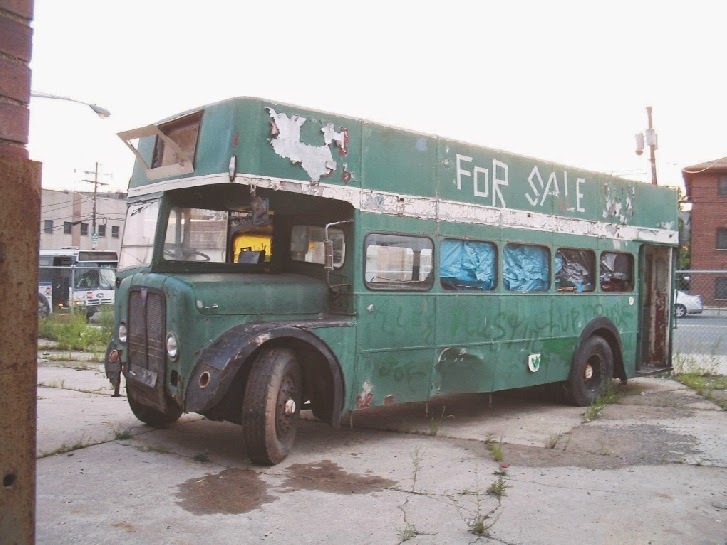 Advertised on eBay on 30th June 2005 was this open top double decker, situated in Bayonne, New Jersey, USA. Pictures courtesy Alex Hall, NY. 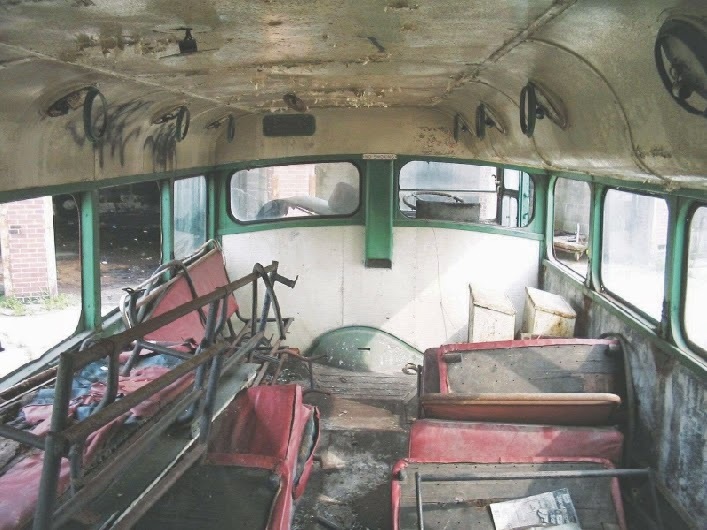 Closer inspection of the photographs revealed that it is the last survivor of fifteen Weymann L30/26RD bodied lowbridge AEC Regent IIIs supplied to South Wales Transport in 1954; (425 - 439 JWN 901 - 915), later renumbered 1174-88. 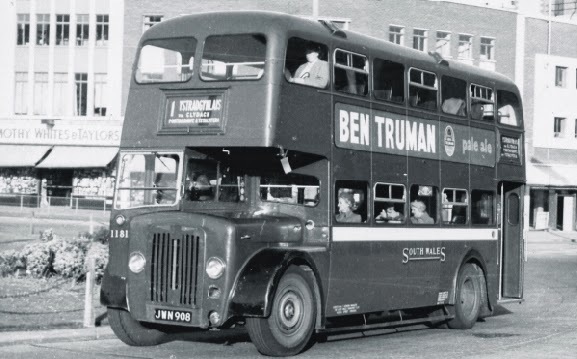 These distinctive vehicles had 'new look' tin fronts, based on a Birmingham City Transport design. 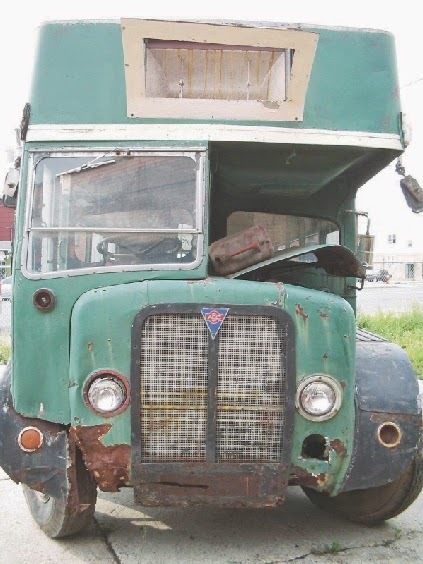 This amazing survivor is former 1181 (JWN 908) which was reported as sold to an owner in New Jersey, USA in 1969 and hadn't been heard of since! 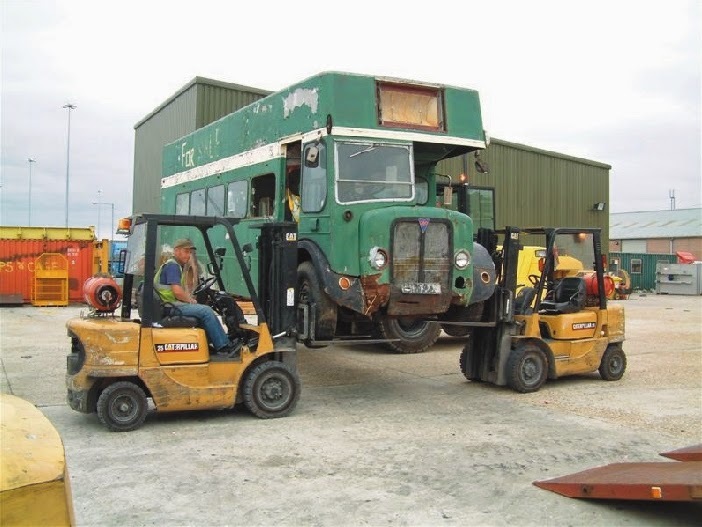 The bus left New York by ship on 16th August, arriving back in the UK approximately 7 days later. 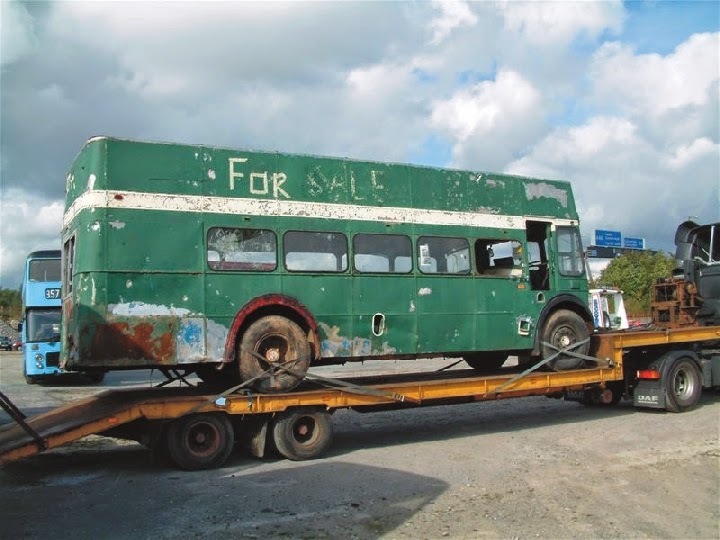 The vehicle is now in store at Swansea Bus Museum pending restoration. when still quite new and displaying its original fleet number, 432.
and was used on Swansea Valley services. 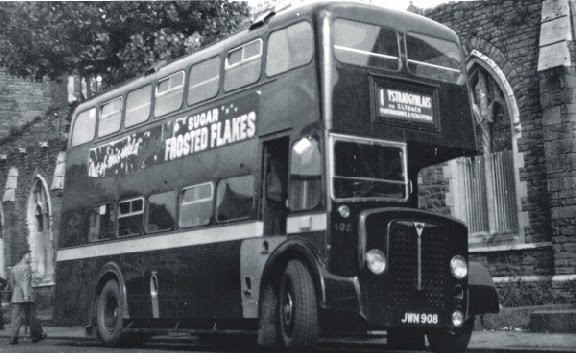 JWN 908 a few years later at Kingsway Roundabout, Swansea, carrying fleet number 1181.
illustrating the later condition of these vehicles, with a modified radiator grille. 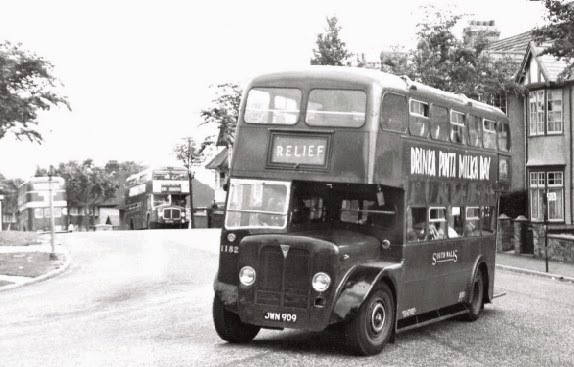 JWN 908 was withdrawn from service in 1965, being sold to Safford & Son, Little Gransden (Cambridgeshire)in December of that year. 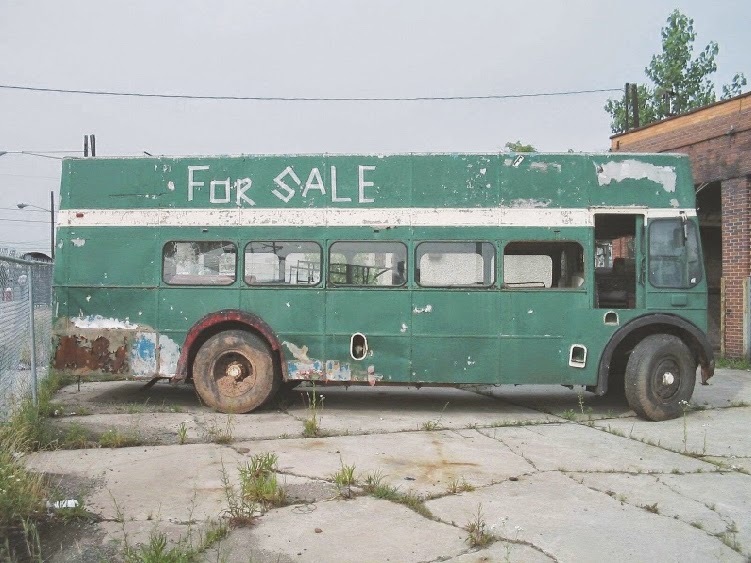 In December 1968 it passed to dealer Passenger Vehicle Sales at Canvey Island and from there it was exported, being acquired by Nancy Taylor Career Courses, Watchung Avenue, Plainfield, New Jersey, USA by August 1969. By June 1978 it had passed to Jane Boehmer, General Learning Press, Morristown, New Jersey and then in April 1979 to Eric A Friis, Oak Ridge, New Jersey. By March 1980 it was in the ownership of Don J. Roe, of Landing, also New Jersey. 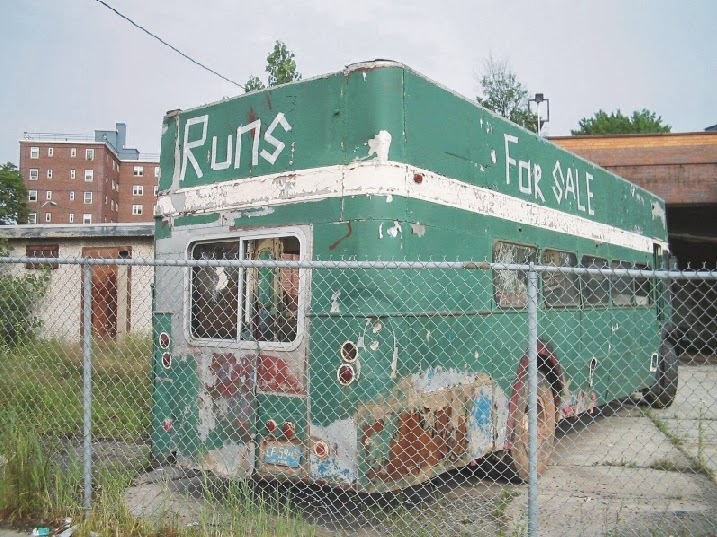 It was used as a shuttle bus for an Irish bar named Muldoon's Saloon somewhere in the Lake Hopatcong area. It was probably at this time that it was painted green. Latterly it was apparently laid up as an 'eyecatcher' for the bar by the side of Route 10, probably from about 1988 which was when the licence plate expired. In May 1996 it passed to George Dolan of Gasoline Alley, Kennedy Boulevard, Bayonne, New Jersey. Under this ownership the roof and upper window pillars were removed, the intention was to replace it with a canvas roof. The rear window was also replaced with a larger sliding one. 19th September 2005. Pictures courtesy Ray Evans. This Blog has been set up to complement the photographic website which is not configured to include lengthy text items or documents. It will therefore serve as a depository for the numerous illustrated articles which were previously published on a separate website and in local newspapers several years ago. The Blog will also be a home to all those miscellaneous bits and pieces which don't logically fit into the photographic site. Please feel free to add additional information (or corrections!). Furthermore, the main site does not accept Java coding, so a number of additional features are being reintroduced here; this includes video and audio files. What's left of the Mumbles Railway? Memories of SWT in the '50s and '60s. A UW LS in OZ. Around the Docks - for 3/3d! © Phil Trotter MMXVII. Simple theme. Powered by Blogger.